If you love your mens gold spiked loafers to have that smoking loafer style but are outrageous in style and attitude because they have spikes all over them, you need to take a look at what Asher Green loafers are all about. These high fashion formal style mens gold spiked loafers have that king of the club look that just makes heads turn quick. 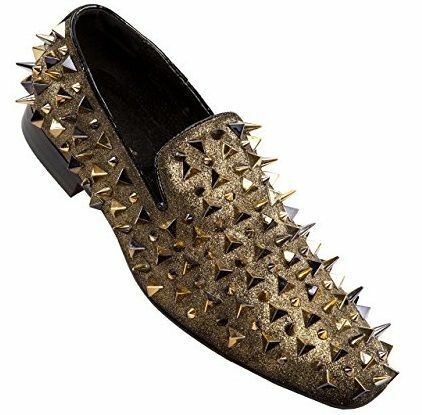 Featuring gold glitter suede with all over gold spikes, these designer style mens gold spiked loafers are what you want to be seen wearing.